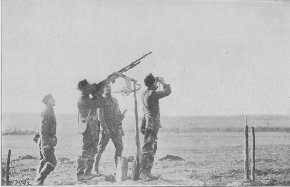 1st Division operating anti-aircraft gun, in action northeast of Fleville. 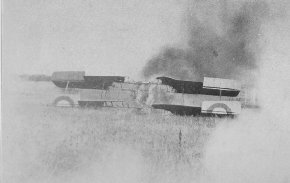 View of burning American plane, just forced down in flames by a group of German planes. American soldiers have rushed to the rescue, despite the German planes overhead, to remove the pilot, 2nd Lieutenant H. E. Loud, Reserve Military Aviation, 88th Squadron, who is badly burned. The observer, Captain Chas. Trickey, United States Coast Artillery, jumped to safety as the plane landed. 4th Division. Near Nantillois, September 28, 1918. 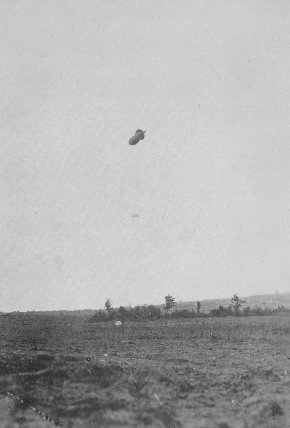 Observer dropping from balloon of the 6th Company after he was hit by German aviator, Hans Helurich Marwede, Etats Maessinger, unterofficier, who immediately started back to the German lines.